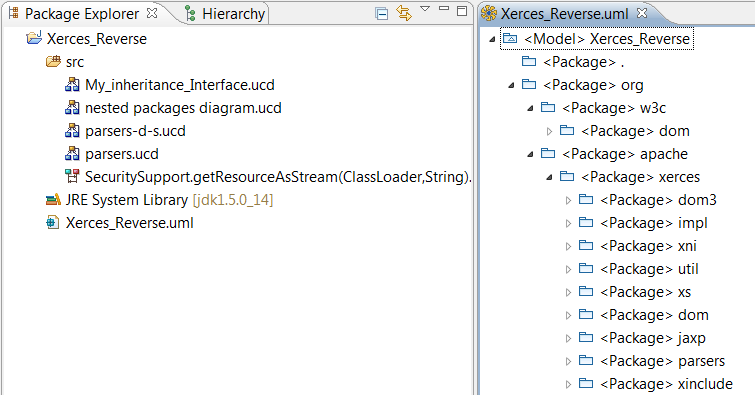 In this example we are going to reverse the full Xerces project java code information and map it to the model .uml file. 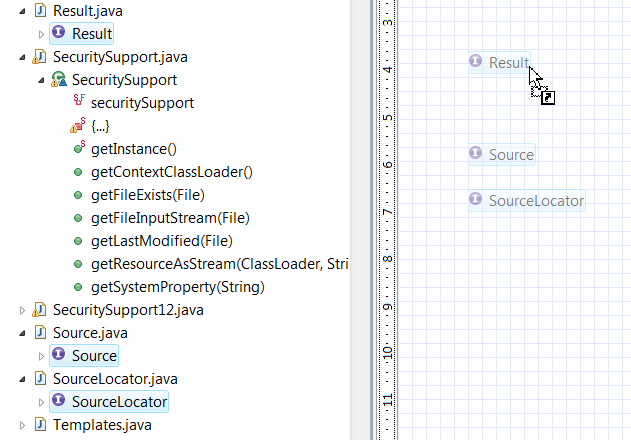 We have decided for the purpose of this example to map all java information with the model. If you prefer just to have a view of the code and don't need need to save all Java code project in your model then see the Create a View of your Project section. 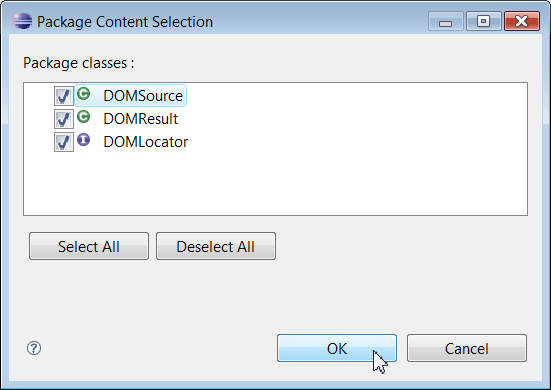 Create a Java project by selecting the Package Explorer > New > Java Project. 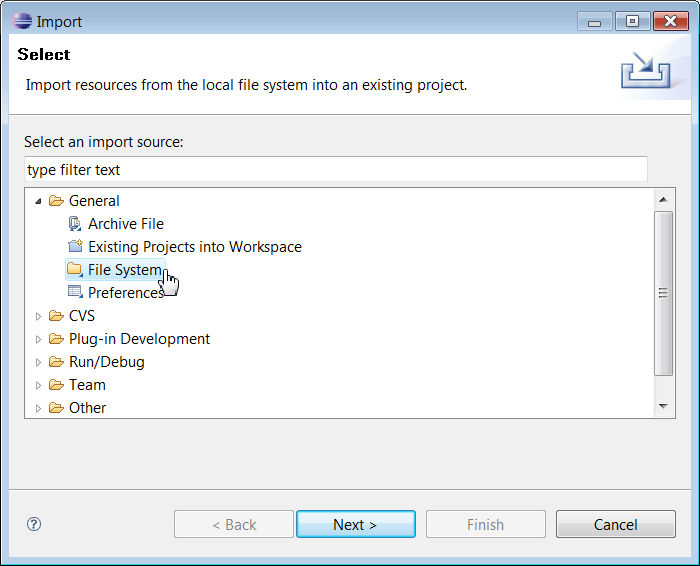 Enter the name of your project in the Project name field and select the Create separate folders as sources and class files option (e.g. create a src at the root of your project). 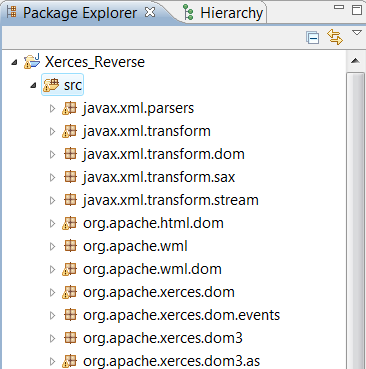 Your project structure has been created inside the Package Explorer. Select General > File System. Browse your hard disk and select your project source code. 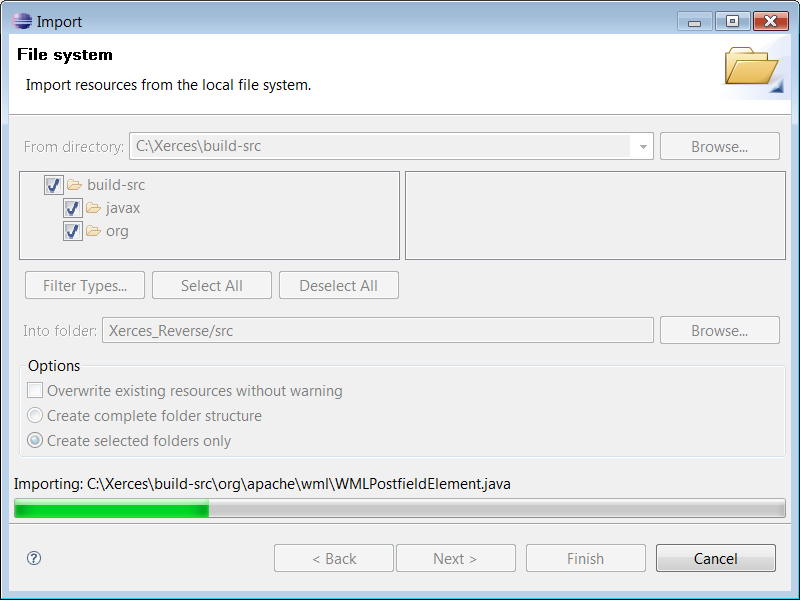 Click on Xerces folder and select build-src. 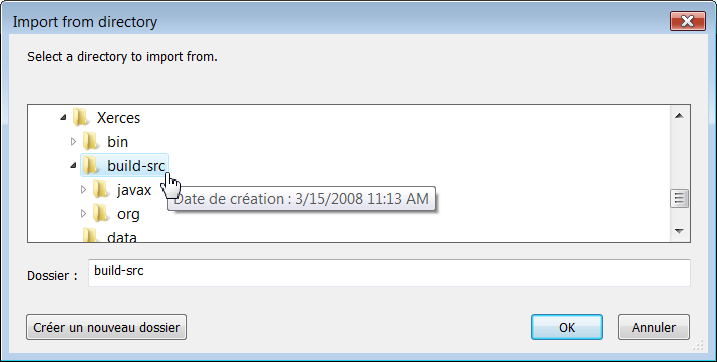 Select build-src folder and click on the Finish button. Eclipse will immediately import your code inside your java project. You can see the newly imported project in the package explorer. To save all your structural project (e.g. classifiers and connections but not business rules) select in the Package Explorer src > Open / Revers UML > Deep Reverse > XMI Backup. This heavy refactoring process will take few minutes to complete. At the end of the process the Model has been created including all Java information. 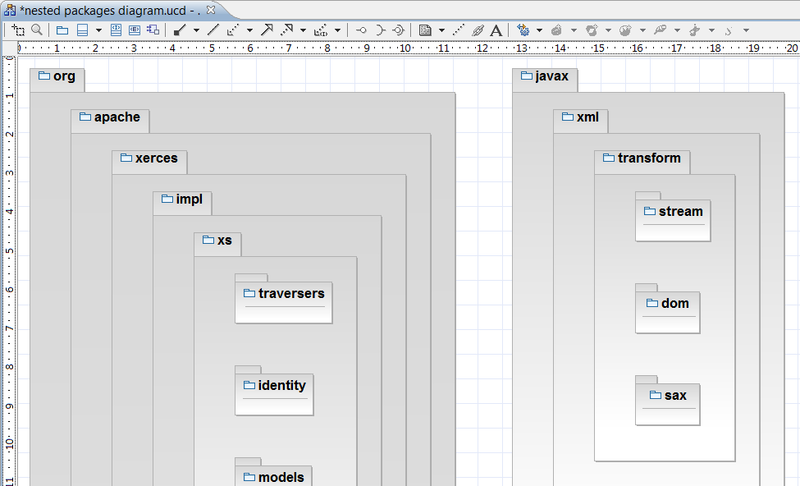 To visualize the model click on the Xerces_Reverse.uml file > Open With > Omondo XMI 2.1 Editor. Here is the newly created model. 3. Nested Package View of your project. To get a nested package diagram view of your project you need to click on the src > Open / Reverse UML > Nested Package Diagram. To select the level of depth click on the top down arrow or write a number in the Deep field. 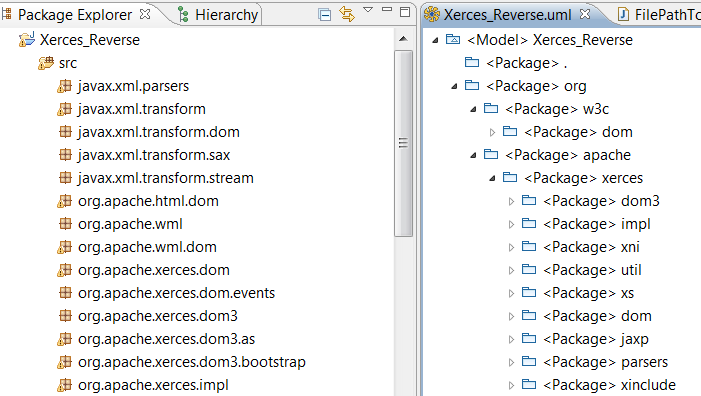 Here is the nested package giving a structural view of the Xerces project. 4. Reverse of a package. You can reverse multiple packages classifiers by reversing a package and adding classifiers from both the XMI Editor or the Package Explorer. 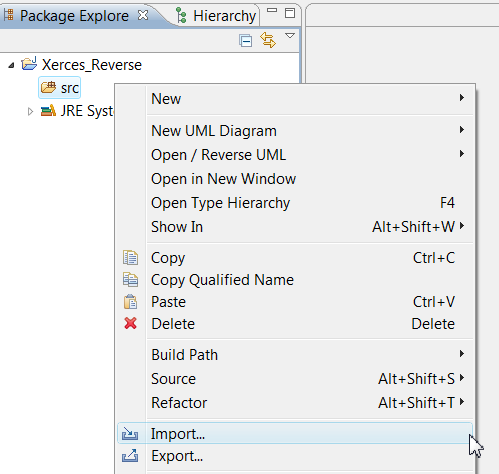 To reverse a package you can either double click on a package inside a package diagram or select a package in the package explorer. either create a class diagram with a name that you manually enter. 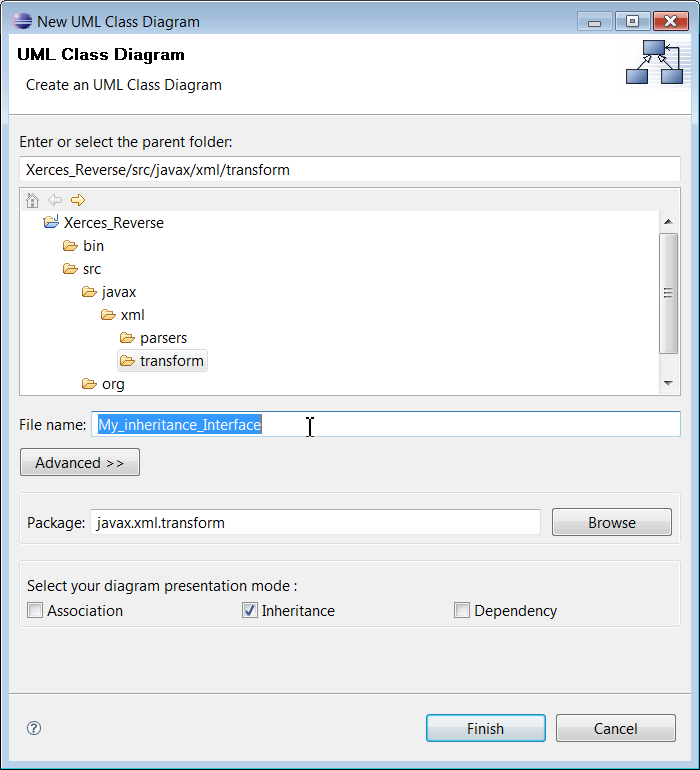 Click for example on javax.xml.transform.dom package > New UML Diagram > UML Class Diagram. 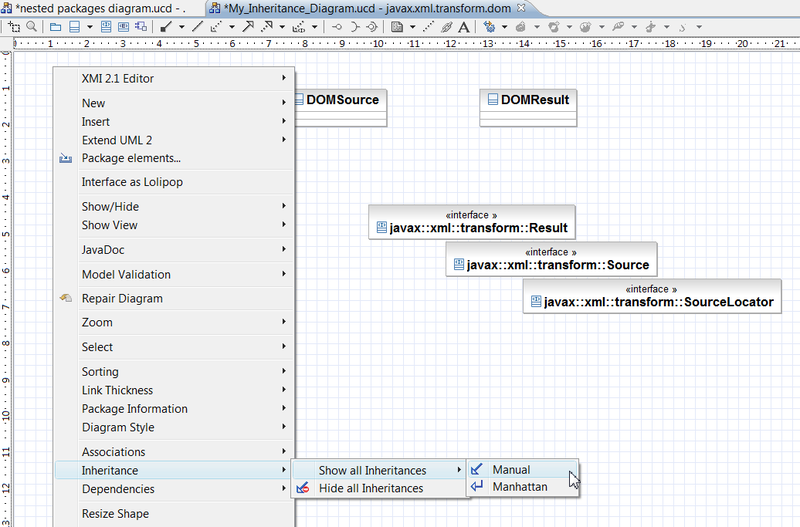 The My_inheritance_Interface class diagram has been created. Drag and drop from the Package Explorer or Select in the Package Content Selection Classifiers to be inserted inside your diagram. Or use a given name reverse class diagram. Class Diagram allows to only see classifiers if you don't select any option. This is a nice feature if you want to immediately get a diagram and then navigate manually creating your connector links. The advantage of this option is that the reverse is very fast. Class Diagram > Class Inheritance Explorer > Fit Diagram to Screen or Full Diagram. 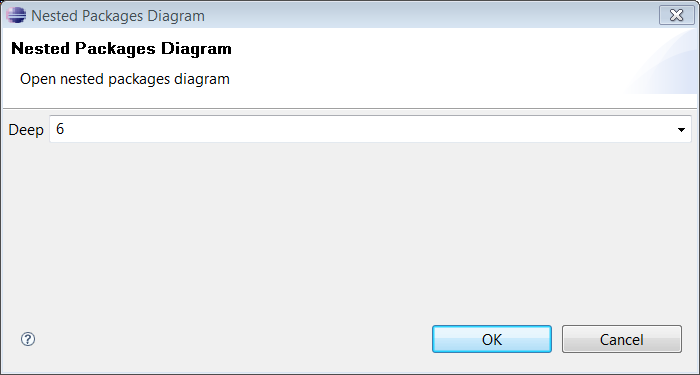 This option allows to immediately get a view of your diagram. You can select to see compartments (e.g. Full Diagram) or not (e.g. Fit Diagram to Screen) in order to have a smaller diagram . 5. See Classes and Interfaces coming from a different package inheritances. You can select a group of classifiers and drag and drop them inside an existing diagram. Select a group of classifiers with the mouse in the Package Explorer and drop them inside the diagram. The new interfaces will immediately be added in your diagram. 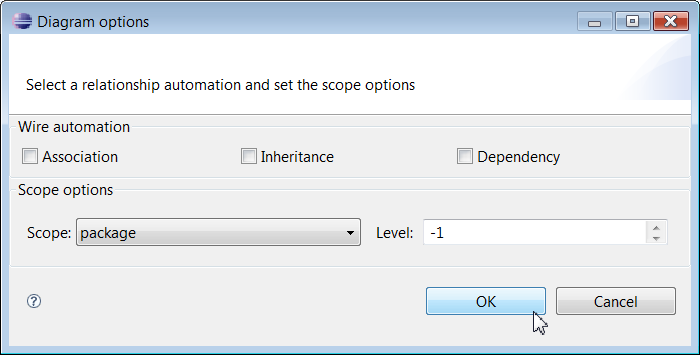 Now click on the class diagram contextual menu > Inheritance > Show all Inheritance > Manual. Here is the diagram you get after using the class diagram contextual menu > Arrange Diagram > Arrange All. Once the XMI Backup has been selected you can delete you all java code and still be able to navigate inside your model. For example let erase all Xerces code from the package explorer and paste and copy your existing diagram at the src root. You can now open any diagram previously created if you double click in the Package Explorer. You can also create new diagram from the model and don't anymore need the java code.